Join us for a rockin’ party! 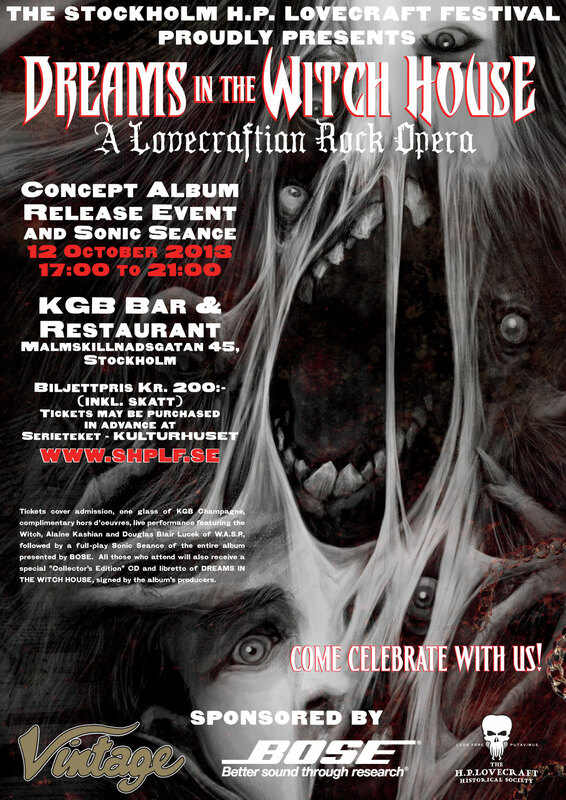 Tickets cover admission, one glass of KGB Champagne, complimentary hors d’oeuvres, live performance featuring the Witch, Alaine Kashian and Douglas Blair Lucek of W.A.S.P., followed by a full-play Sonic Séance of the entire album presented by BOSE. 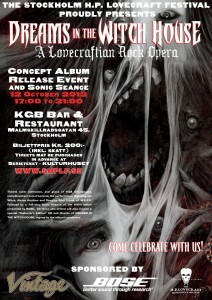 All those who attend will also receive a special ”Collector’s Edition” CD and libretto of ”Dreams in the Witch House”, signed by the album’s producers. Tickets priced at 200 sek (please, cash only) may be purchased in advance at Serieteket – Kulturhuset, Sergels torg 3. Open 11 – 19 week days, 11 – 17 Saturday. NOTA BENE! Brown Jenkin takes no responsibility for displays of public drunkenness (by himself or others), people falling through dimensional portals or other shenanigans that might ensue during the evening.